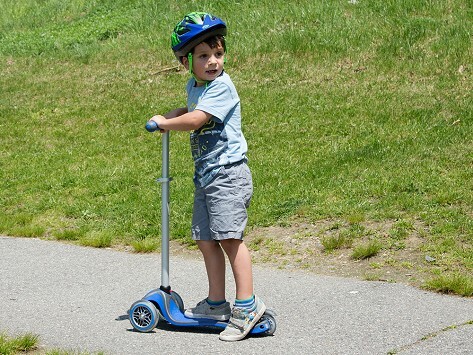 This transforming scooter grows along with kids, thanks to adjustable handlebars with three height settings. The three-wheeled design rides smoothly and adds stability that makes it less likely to tip over, too. You can even lock the front wheels to stay straight, so it’s easier for first timers to learn on. Care: Wipe the scooter with a damp cloth and air dry completely before storing; always wipe away excess grime from bearings to keep them rolling smoothly. To lengthen wheel bearings lifespan, it is recommended to spray them with light machine oil. Adjust handlebars to 3 heights from 26.5” to 30.5"
Caution: Check that all bolts are secure and tight before use and that the brake on scooter is functioning correctly. Helmet use always recommended while riding. Great Scooter and Very Well Made! It would be wonderful if everything could grow along with your kids, but at least their favorite scooter will stay with them for years.